In Australia Foursquare has gained alot of users and attention over the past couple months. Not quiet at the same level, Gowalla a similar Geo-location service has enjoyed success in Australia with more game like features. Brightkite is another new entrant to the market and whilst not as big as Foursquare or Gowalla they have gained a good base of active users so far. utest.com conducted a survey/test amongst the 3 services to see what users thought was the best. The participants were then asked to report their findings on the following categories ease of use, opportunity to earn deals, location accuracy, status features, friend connectivity and social media integration. Foursquare ranked first in all but location accuracy. The most significant feature for users at 46% was ‘easy of use’, location accuracy coming in second at 24%. 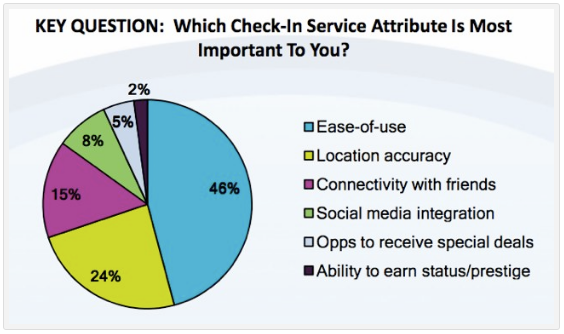 80% of survey participants indicated that they were concerned about the impact checkins had on their personal safety. 49% said they don’t use any of the services anymore due to privacy concerns. All in all Foursquare is leading the Geo-location checkin market so far, but it really is early days and anyones games for now.